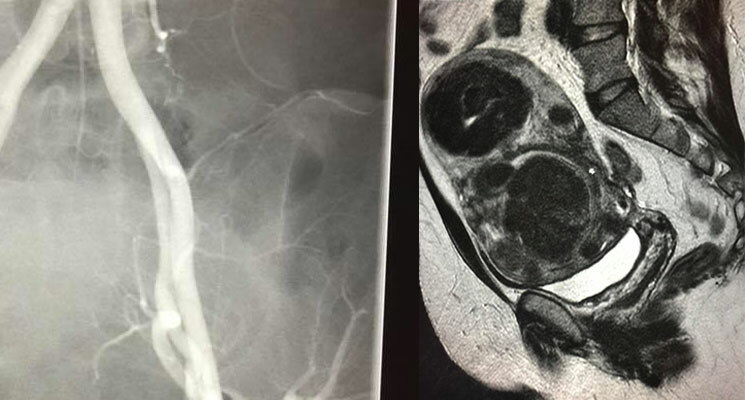 38 year old female with large fibroids in the uterus. Uterus is size of 6 month pregnancy. She complains of severe pain and irregular bleeding because of the fibroids. She elected to have an uterine artery embolization (also known as uterine fibroid embolization UAE/UFE) instead of surgery. We inserted a microcatheter into the uterine arteries and blocked off the blood supply to the fibroids with microspheres. 1 month later all her symptoms have resolved. 6 months later her fibroids have all shrunk or disappeared with no blood flow to the fibroids. And uterine function is normal! !